Speed Check measures the download (from the internet) and upload (to the internet) speeds of your Wi-Fi. It measures the rate of data between your internet service provider (ISP) and your primary node (the one connected to your modem). It is a good way to find out if you are getting the level of service promised by your ISP. Traditional speed tests are not as reliable as Velop’s speed check because they measure speeds at the device level. 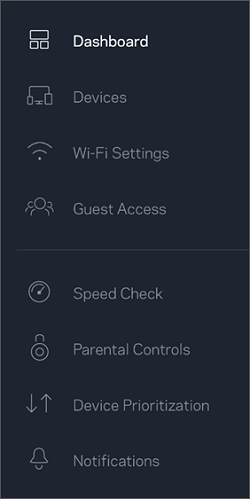 Measured that way, speeds will vary depending on a variety of factors, including ISP account type, local and worldwide internet traffic, the number of devices in your home that are sharing the internet connection, and what those devices are doing. 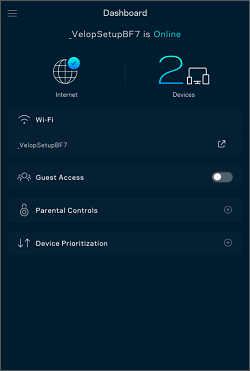 Log in to the Velop dashboard. For instructions, click here. The speed check will automatically begin. Download Speed - The rate at which internet content is transferred to your Velop system. Upload Speed - How quickly you can upload content to the internet. Ping (latency) - Measured in milliseconds (ms). It is the amount of time it takes for data to travel from your ISP’s servers to your network. 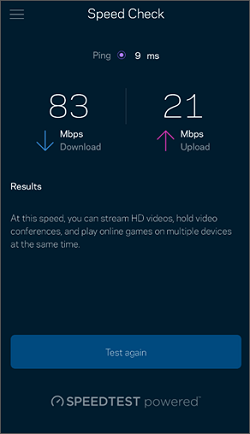 Results - Gives you a description of what activities your internet speed will allow you to do based on the speed test results. To stop the speed check, tap the Menu icon. NOTE: When testing the speed of a router with Wi-Fi security enabled, use the WPA2™- Personal encryption option. This is a hardware-based encryption protocol and will provide the best test results.